Perhaps this is sacrilege on a blog populated by homemade cookies and New Orleans pralines, but today I want to sing the praises of one of nature's great desserts: watermelon. I was pleasantly surprised to find a decent seedless melon at the supermarket this early in the season. My favorite preparation is peeling the melon, cutting it into fairly large cubes (perhaps 1.5 inches per side), and putting it in a bowl in the refrigerator. The melon then gets uniformly icy cold, and it's easy to eat with fingers or a fork. I love the juicy crunch as I bite into a piece of watermelon and the sweet, pungent flavor that is unmatched by any other fruit. While regular watermelon is equally delicious, I prefer seedless to avoid the crunch of hidden seeds and the hassle of trying to avoid them. 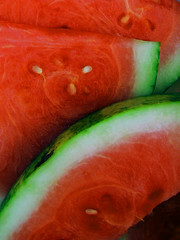 A cube of a decently ripe seedless watermelon, though, is a bite or two of pure perfection.